Hi, I tried the exercise from Sessions 14-15 to draw a box around the playfield. 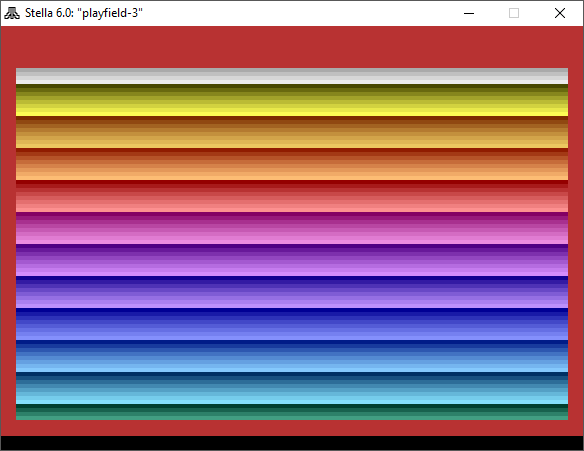 But my code is rendering funky in both Stella and z26. In Stella, the top wall is rendering twice as thick as the horizontal walls, while the bottom wall is the same thickness as the horizontal walls. (My understanding is that the top wall should be the same thickness.) In z26, the top wall is roughly 4x thicker than the horizontal walls, with a corresponding black gap at the bottom of the screen with a thin red line below that. I tried Andrew Davie's exercise code provided in Session 15, and the output looks very similar to mine in both Stella and z26, not matching what the screenshot shows. Though his has a black background (mine has the rainbow background), he still has the extra thick top wall, and in z26, the black gap on the bottom. 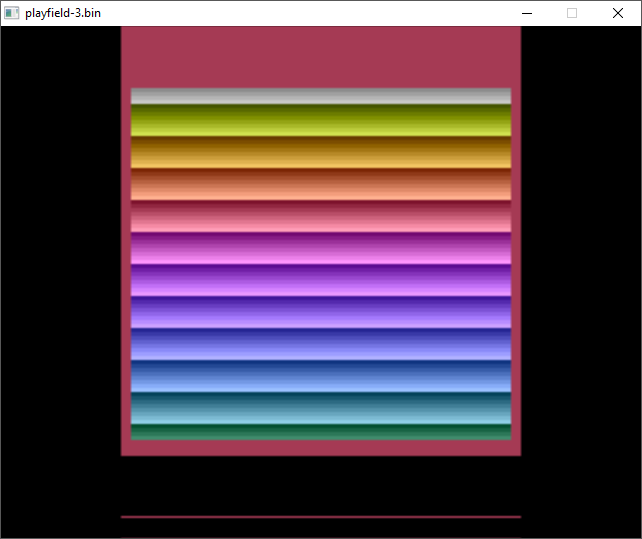 I just tried this code on an actual console, and the output matches Stella 6.0 exactly (well, except the colours are slightly different, but that's to be expected). z26 hasn't been updated in many years, and I recommend to do all further testing in Stella. Aside from not being updated in (nearly) a couple of decades, z26 was only useful for producing a detailed trace file...but that isn't needed with Stella's current version, since the time machine function is more convenient. Plus you get real-time results when altering things on-the-fly, which is impossible to do with z26. Edited by Andrew Davie, Tue Apr 9, 2019 5:44 AM.